Tá gach duine sa scoile tar éis a bheith ag obair go dian leis ár ndara Brat Glais a bhaint amach bunaithe ar an téama 'Fuinneamh'. Chuir an Coiste Glais lá mór gníomhaíochta ar siúl timpeall na scoile ina raibh leath lá gan leictreachtas againn ar fad! 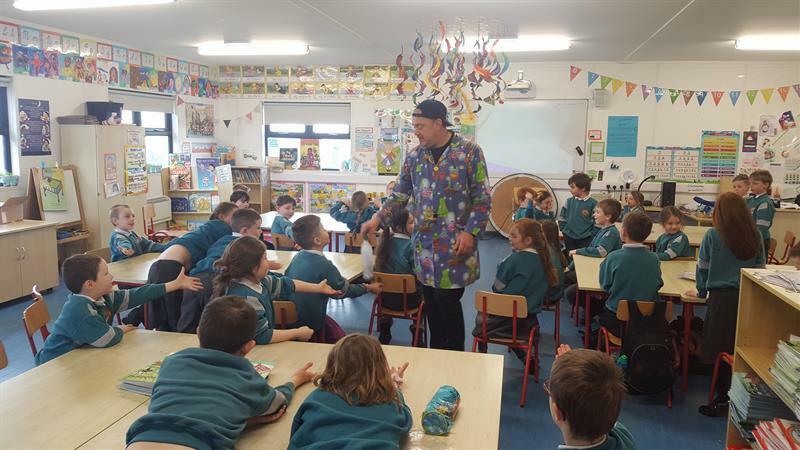 Bhí ceardlann eolaíochta leis an Mad Professor ag Rang 1, ceardlann ealaíne ag rang 2 ina rinneadar muileann gaoithe agus ceardlann ceoil ag rang 4 agus 5 ina chualadar amhráin faoin timpeallacht a choinneáil slán. Everyone at school has been working hard to get our second Green Flag which is based on the theme 'Energy'. 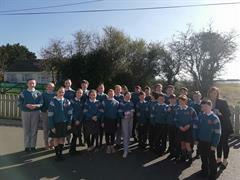 The Green Schools Committee organised an action day where the whole school went without electricity for half a day. 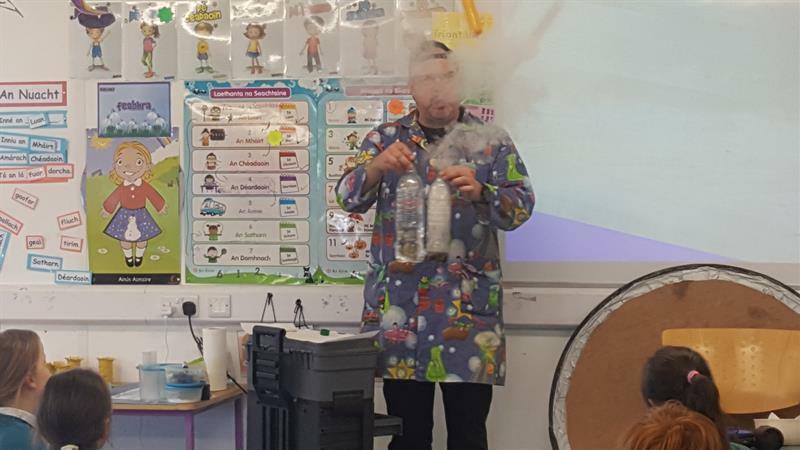 Rang 1 had a science workshop with the Mad Professor, Rang a 2 had an art workshop where they made windmills and Rang 4 and 5 had a music workshop where they listened to songs about keeping our environment clean. Céard é an Coiste Glas? 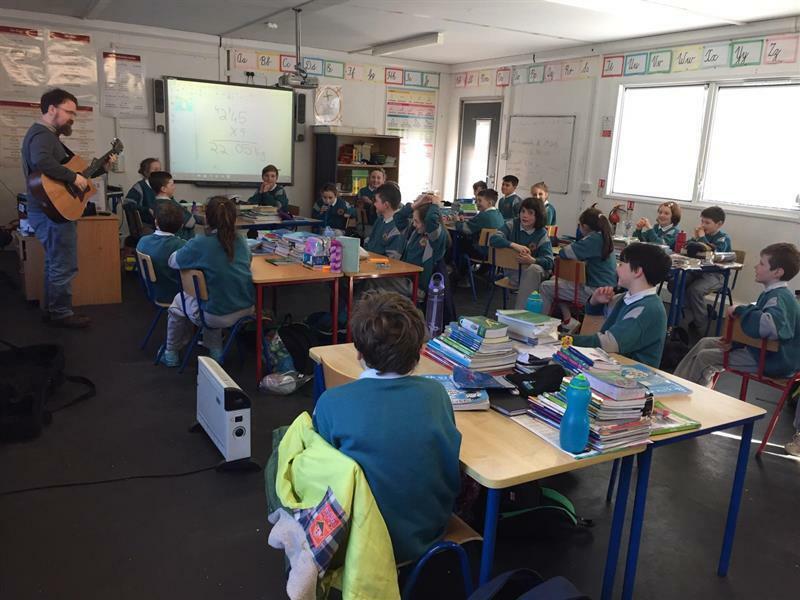 Roghnaíodh Coiste Glas sa scoil ag tús na scoilbhliana. Tá páistí ó rang 3-6 ar an gCoiste seo. 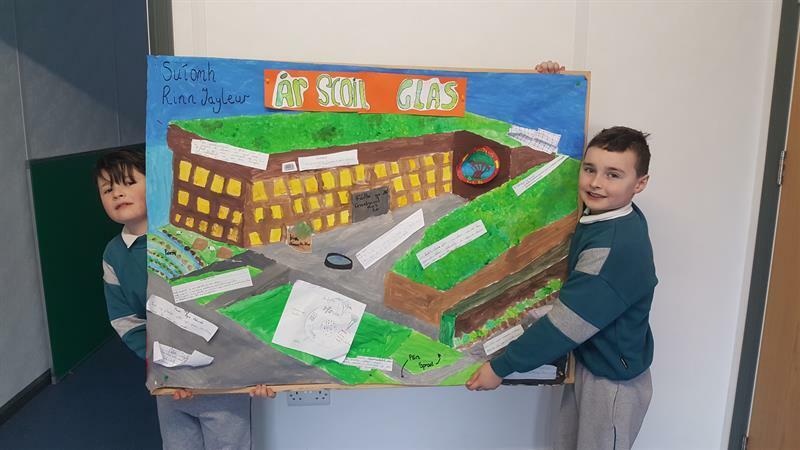 Cinntíonn an Coiste Glas go mbíonn timpeallacht shláintiúil, ghlan, ghlas ag an scoil. Spreagann siad páistí athchúrsáil a dhéanamh agus eagraíonn siad imeachtaí iontacha chun saol ghlas a bhaint amach. Céard a dhéanann an Coiste Glas? Buaileann an Coiste Glas le chéile gach mí chun rudaí a phlé. Pléann siad suirbhéanna atá déanta agus iad ag dul timpeall chuig na ranganna ar fad ag fáil eolais. 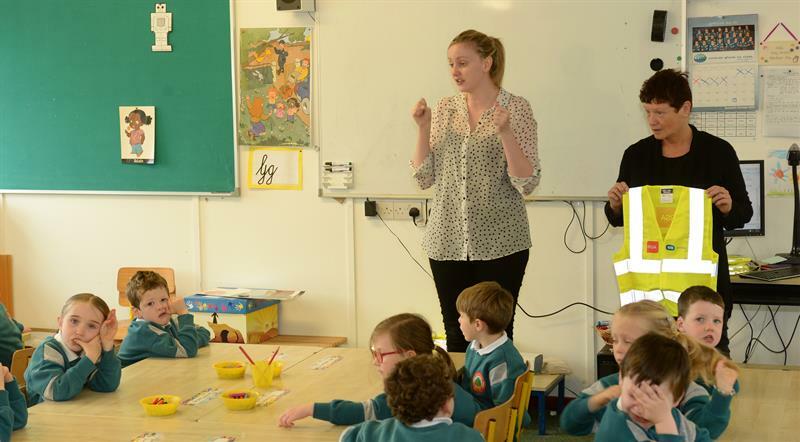 Labhraíonn an Coiste le Múinteoir Emma agus Rachael faoi imeachtaí srl. gur féidir linn a eagrú chun scoile níos glaise a bheith againn. 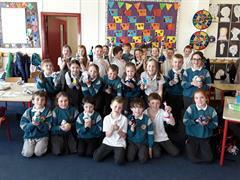 Téann an Coiste Glas timpeall go minic chuig na ranganna ag seiceáil go bhfuil na páistí ag baint úsáide as na boscaí bruscair ‘is boscaí lóin i gceart. Labhraíonn siad leis na páistí eile ‘is roinneann siad eolas leo. 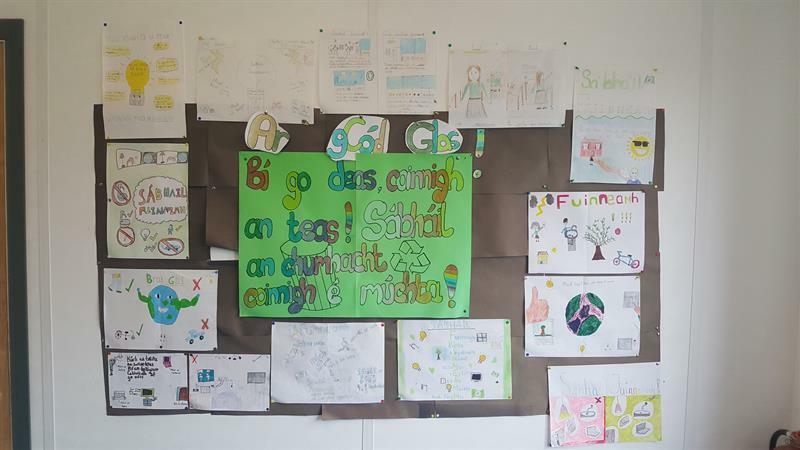 Mar shampla, ní úsáidimid scragall stáin inár mboscaí lóin i nGaelscoil Ros Eo. 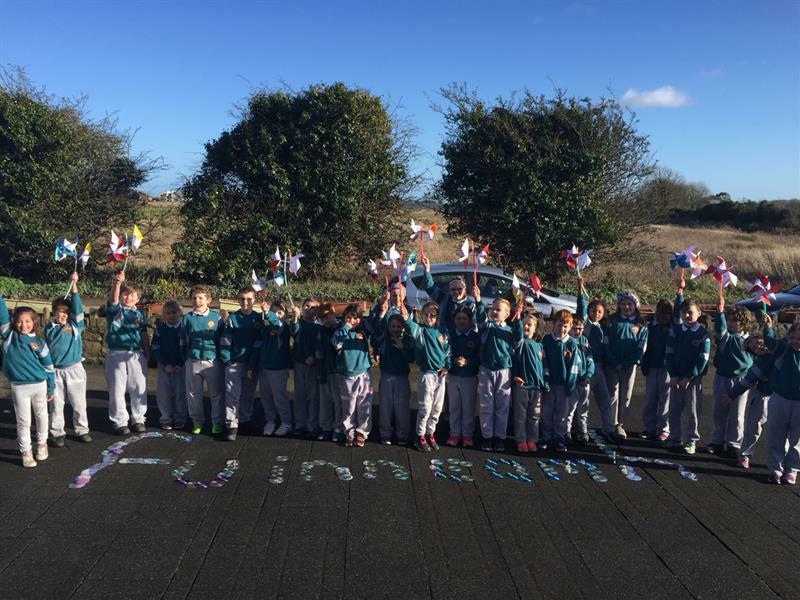 Le déanaí, bhí seó faisin bruscair ag an scoil. Rinne na páistí éadaí, seodra agus hataí as bruscar gur féidir leo athchúrsáil. Baineadh an-sult as an seó faisin seo. Bhí sé ar fheabhas na páistí go léir a fheiceáil sna feistis a cuireadh le chéile le hábhair athchúrsála. Fiú ag deireadh an lae! Céard a fhaigheann an Coiste Glas as an obair iontach a dhéanann siad? I mbliana, bhí an t-ádh linn ár gcéad bhrat glas a bhaint amach. 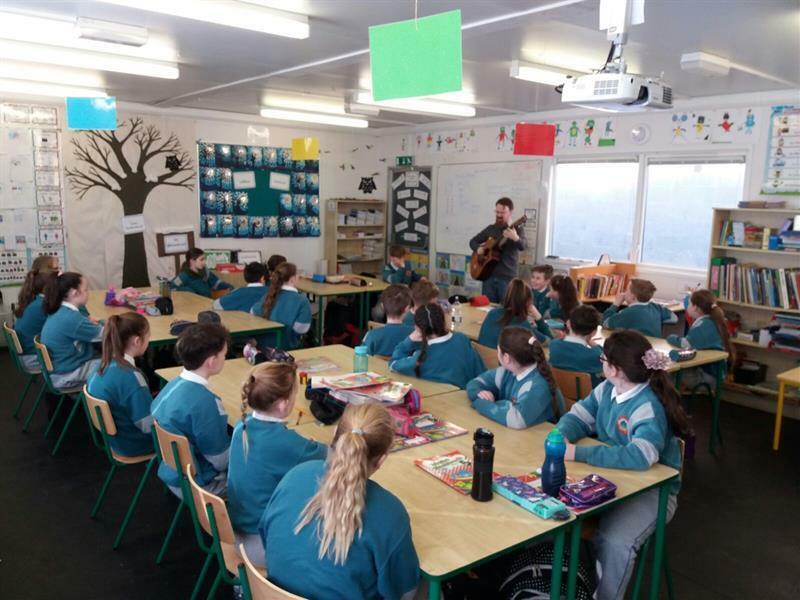 Bronnadh an brat glas ar bheirt ón gCoiste Glas sa Heilx le scoileanna eile a bhfuil obair den scoth á ndéanamh acu ó thaobh athchúrsála de. 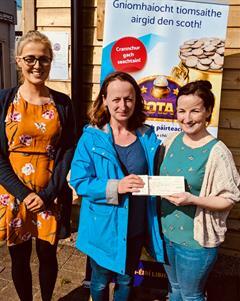 Tá sé soiléir go bhfuil neart oibre déanta ag an gCoiste Glas, Múinteoir Emma agus Múinteoir Rachael. Maith sibh! Coinnígí glas é! A Green Committee was appointed at the beginning of the school year. 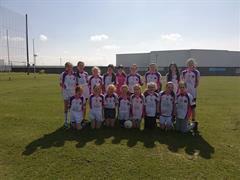 Children from 3rd - 6th class were elected to this committee. This Green Committee aims to promote a healthy, clean, green environment at school. Through this committee all children in the school are encouraged to recycle. Fun events are also organised. What does the Green Committee do? The Green Committee meet once a month to discuss matters relating to recycling and a green school. They discuss surveys they have completed while going around to all the classes gathering information. The committee discuss various events/activities that could be organised to make the school greener with Múinteoir Emma and Rachael. The Green Committee often check with all classes that the children are making correct use of the bins and lunch boxes. 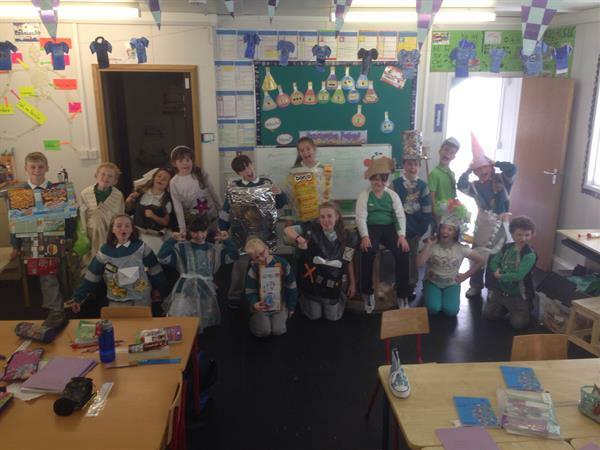 They share useful information with the children, for example we don’t bring tinfoil in our lunch boxes in Gaelscoil Ros Eo. Recently, a Junk Couture fashion show took place at school. The children made clothes, jewelry and hats out of rubbish that can be recycled. It was very enjoyable and it was fantastic to see all the children on the catwalk in their outfits made out of recyclable materials! Is the Green Committee rewarded for the super work they do? This May our school was awarded with our first green flag! 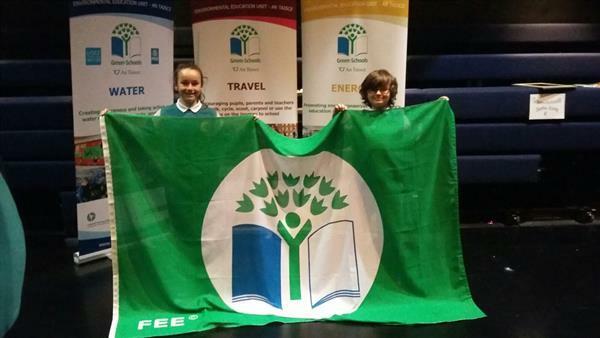 The green flag was presented to two children on the Green Committee in the Heilx along with other schools. This precious green flag is a testament to the super work that is being carried out by the Green Committee, Múinteoir Emma and Múinteoir Rachael. Well done! Keep it green!